The Kitesurfing season in Cape Town takes place from October to March every year at which time thousands of ardent kitesurfers flock to the Cape Coast to indulge their passion. Between the months of October and March, Cape Town enjoys fairly constant, predominantly south-easterly winds that bring with them temperatures varying from 25°C to 30°C and are ideal kite surfing conditions. 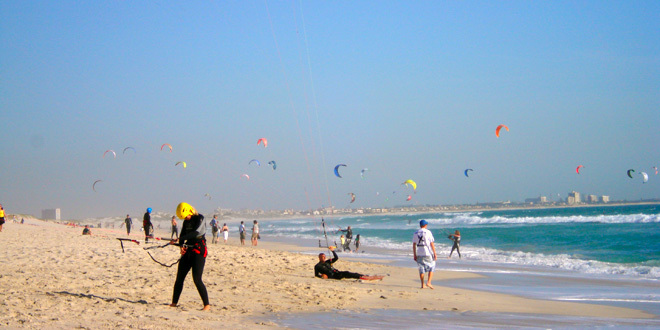 Two of the more popular spots for kitesurfing include Bloubergstrand (with its picture-postcard backdrop of Table Mountain as an added attraction) and Langebaan (on the Cape West Coast). Muizenberg on the False Bay coast is also a popular spot, especially with local kitesurfers. If kitesurfing is one of those things you’ve always wanted to try, you’ll find that there are plenty of kite surfing schools in Cape Town. They provide personal instruction, experienced instructors and all equipment you will need so you could be mastering the seas in no time!